Before anyone feels the need to point it out to me: I’m under no illusions. I know what this stuff looks like. Anyone who says that chip shop curry sauce is attractive is literally just plain wrong. However, I also know what this stuff tastes like, i.e. nectar of the gods. I bet Thor is drinking curry sauce as we speak. 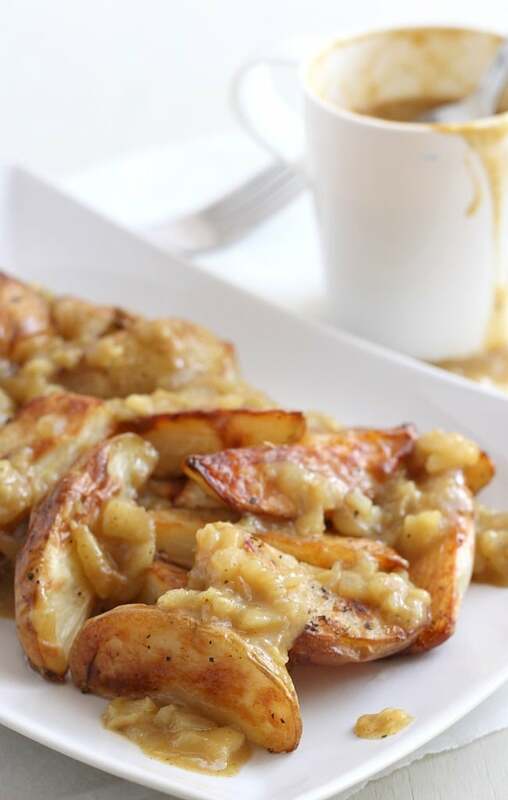 Which is why I’m posting this recipe despite its somewhat questionable appearance… yeah. Very questionable. If you’re not British, I’m not sure whether you’ll have come across this style of curry sauce before. Here, you’ll find it in near enough every fish and chip shop (unless there’s a sad corner of the country that I’ve not yet visited who haven’t yet discovered the wonder of having curry sauce on chips). And you get a fish and chip shop on about every third street – that’s a lot of curry sauce. There’s nothing authentic about chip shop curry sauce. Don’t go thinking this is some Indian delight… it’s not exactly meant to be gourmet. This is the sort of thing you might eat while you’re stumbling home after a night at the pub. Or, you know, on a Friday night in front of the telly. If you ever fancy making your own curry sauce, it’s actually really easy. 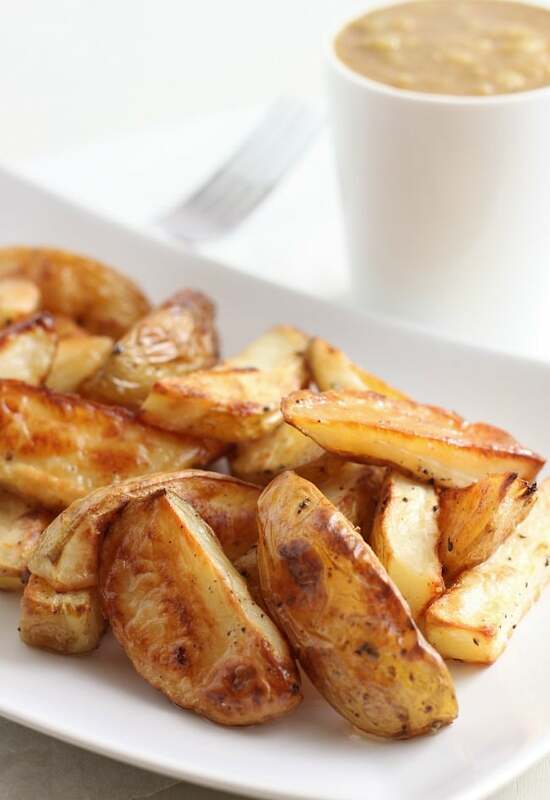 Of course you’ll need a big batch of fat British-style chips (none of this thin French fry nonsense). I made my own, but you may well decide to go for frozen ones. They kind of fit the theme here so no shame. 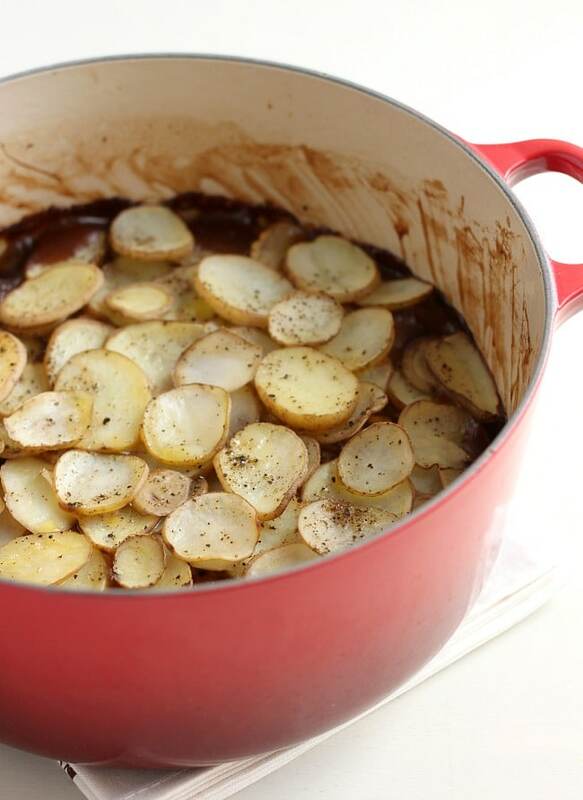 To make the sauce, start by cooking up some onion, garlic and apple (I know, it’s weird, but it totally works). Then add some flour, stock, and of course your curry powder. And that’s literally it. We’re not exactly fussy, us Brits. All that’s left to do is pour it over and dig in. Preferably with a plastic fork, or one of those wooden ones with only two prongs (what’s with those, by the way? Utterly useless. It’s like trying to eat with a stick). Heat the oil in a deep frying pan, and add the onion, apple and garlic. Cook over a low heat for 5-10 minutes, until everything is very soft. Add the curry powder and flour, and mix well. Then pour over the stock and add plenty of black pepper. Your sauce will probably be quite chunky, so if you’d prefer a smoother sauce, just give it a quick blitz with an immersion blender. This will thicken it up a bit too. I half-blended mine, so it was quite thick, but there was still some texture. I was struggling to find a reasonably good recipe for this, and your recipe always helped me to nail it. Once I made it too sweet because of the sweetness of the apple, but next time I used only 1 apple and 2 onions. I also blended it to a fine gravy consistency and reduced to a rich flavoured curry. This curry sauce is pretty much the same that goes with Japanese Katsu. The only thing which is slightly related to Indian is the curry powder. The masala is mostly corriander based. As an Indian, and curry fanatic, I think this curry is one of most delightful curries I have ever had. Thanks to you and person who thought about the combination of chips and curry sauce. 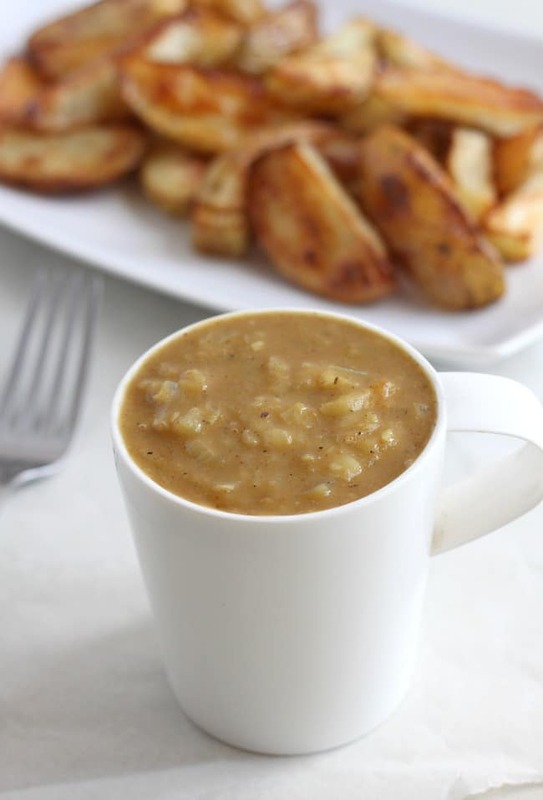 This is a great base to make the classic chip shop curry sauce. It does IMO need more “oomph” for a classic chippy, so I added three teaspoons of curry powder, a teaspoon of Cayenne, a teaspoon paprika and a teaspoon of peanut butter. Chip shop curry is also a lot saltier so I added both salt and a splash of light soy sauce. Thanks! OH, MY GOD!!! I am ecstatic to find your site & this recipe. I lived in England in Oxford & Manchester for a couple of years after I finished college and fell in love with the curry gravy. Could never find any around home or a good recipe either until now… I am putting the ingredients on my shopping list right away!!!! I’ve recently stumbled upon your site and found this recipe. It is amazing. I’ve made it four times now, I always add more curry powder but that’s just taste. I’ve also added cayenne or fiery chilli, added extra apple and changed the apples I use. I now have to make double so my Dad can have some too! It’s so much better than the local chippy. Thank you. Hi, tried this recipe and though a little sweet I adjusted it to my taste. Very nice thank you. The only thing I want to know is I have some left over and wondered if it can be frozen? T.I.A. Thanks Mini! :) I haven’t tried freezing it but I would definitely give it a try, can’t see why it wouldn’t work! Haha! Sounds like you changed a lot but I’m glad it worked for you!! Hi, I’m having trouble getting the taste just right. 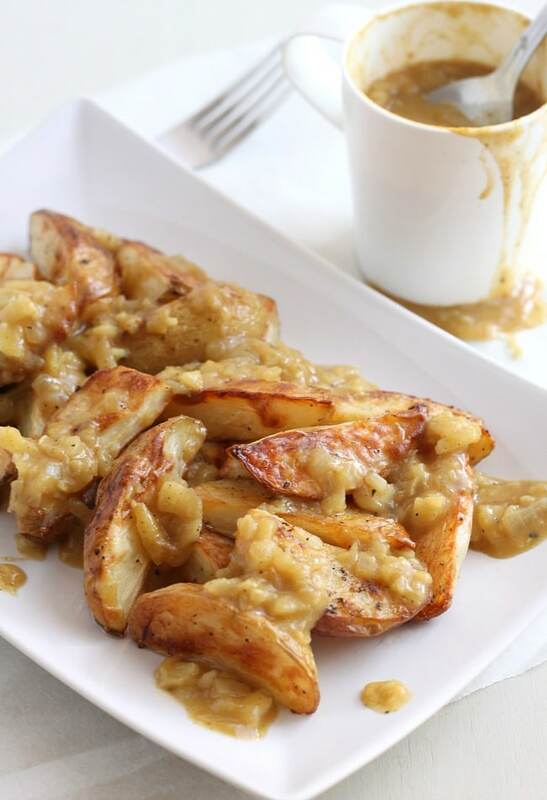 What type of apples and curry powder has everyone been using? Living abroad. Decided to try this. I didnt chop the apple and onion as fine as i should have done. It didn’t matter. It tasted great. Better than actual fish n chip shop curry sauce. I added a bit of extra chilli to pep it up a bit too. Great and super simple simple recipe. Thank you. “Chip shop” curry sauce is made (at least used to be made) to use up the leftover mushy peas and beans that didn’t sell. Honestly – I used to watch them make it in my local chippy as a child. Blend a tin of beans and a tin of mushy peas with a tin of tomatoes to slack it – then stir in your ‘curry powder’ – Authentic taste, colour, smell and texture. If you’re careful to pick low salt beans, it’s actually not bad for you – two of your 5 a day and full of fibre. I have curry sauce with chips from the chippy every Friday night! I buy the curry sauce from Tesco though (25p a jar, ha ha) because I don’t think curry sauce in chip shops is ever vegetarian (I think they use meat stock). I keep meaning to make my own and this looks simple enough! This was amazing, thank you! Am currently following Slimming World and wanted a healthier alternative. So was very impressed with this. I did it with a Bramley apple and red onion (that was serendipitous as all we had left!) and also used a splash if white wine vinegar for an extra kick. Fab recipe. I love that this is Slimming World friendly! Good to know – any excuse for more curry sauce ;) Thanks for your lovely comment! I throw in a handful of sultanas and half a teaspoon of honey, as I like it quite sweet. I’ll be looking for more of your recipes. Ooh have you tried this? Great recipe thanks. It’s not just British though, I’m from Ireland and we have a great love of curry chips, curry cheese chip is practically a national delicacy. Thanks for the recipe Becca. I tried it with home made wedges and fish and it tasted great. Even my daughter, who usually likes bland food, loved it. The only thing I’d add is that when I get curry sauce from a chip shop it usually contains raisins. I threw a few into the leftover sauce but they made it a little bit too sweet, so I perhaps I over-did it. Ooh I don’t think I’ve ever had it with raisins – it must vary from place to place. Might try that next time! Thanks for this recipe. I was serving it over rice so I added twice as much stock and added diced chicken to the sauce and let it stew. it was AMAZING! Definitely not spicy. If I wanted that I would have made a Thai Curry. Just used this recipe as a base…craving the taste of my local UK Chinese curry sauce, sadly they don’t deliver to NZ…swapped the apple for ginger and added a bit of cayenne pepper (I’d run out of black pepper). Nearly there…next batch I will try with a pinch of five spice as well. Still close enough though :-) many thanks. Thanks Ant, glad you enjoyed it! Your version sounds tasty! Just made this exactly to the recipe (made some chicken fried rice so it needed curry) but this is nothing like traditional chip shop curry sauce, nothing at all. It’s a fruity gravy with a little curry flavour, and actually tasted more like a korma sauce than chippy curry sauce. It’s nice, but it’s not what it says on the tin. Sorry Becca, disappointing all round. It needs less fruit, more curry, more kick and about a third more stock as it’s way too thick. I am obsessed with all things curry!! I haven’t made authentic british curry with chips, but I might need to try immediately! LOVE me some curry sauce with my fish, chips and mushy peas! My American boyfriend is definitely perplexed by it because it doesn’t look anything like the “curry” he’s used to. It’s definitely an acquired taste and this is the first recipe for it I’ve ever stumbled across, so thanks! Simply sublime this beats all the chip shop ones I’ve had, an instant favourite, cheers! I loved this recipe my whole family loved it next time I will have to double the recipe so we can have left overs for the next night. The only thing I did not add was the red pepper flakes because my kids will not eat anything spicey. Oh also I did not have any regular cider on hand so I used apple cider instead and I did not taste any difference. We all loved it. Hi, looking forward to making this tomorrow – one question… is it ‘freezable’?? Hi Chris, I actually have no idea as I’ve not tried freezing it! I don’t see why there would be a problem with freezing it :) but it makes a relatively small batch anyway and is quite quick to make next time you want it! Thanks Chris, make sure you report back :) hope you like it! Sauce looks great, but really needs a handful of sultanas thrown in before simmering. Have to admit, as soon as i saw this recipe i had to try myself.. Making the sauce later- curry sauce and chips.. One of my favourite dishes! Haha well I’m not sure I’d use the word classy ;) but the sauce sure is delicious!! mmmm I just made this it tastes so banging… did have curry powder just mixed spices powder and sum other kind of spicy powder… didn’t have veg stock but used boiling hot water and lots and lots and lots of salt tastes banging egg fried rice curry sauce mmmm putting the Chinese shops out of business !! Mmmmm looks delicious! I used to live in the UK but moved back to my home country Canada and severely miss curry sauce and chips! Will definitely be trying this one, what kind of apples did you use? 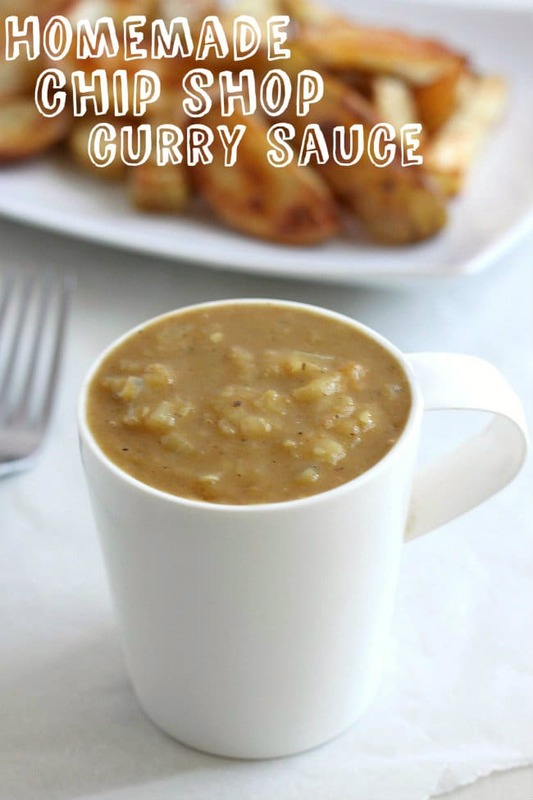 Given my current curry ADDICTION….I kind of want to drink this sauce straight from the cup. Hi Becca, never heard of this type of curry sauce before, sounds amazing. mmm these looks like an amazing combo! my housemate is sitting next to me in a lecture and says this looks amazing Becca. I’ve made this before to pretty much the same recipe and loved it. I have dauphinoise potatoes planned for dinner. Would it be wrong to have chips and curry sauce as dessert? Also there is no way I would have been able to makeit look this good! 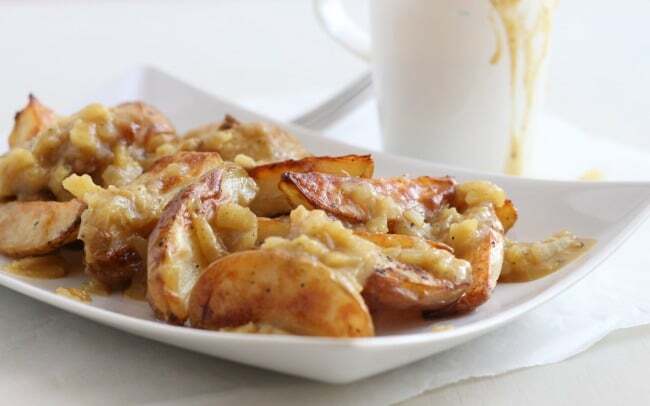 Or dauphinoise potatoes with curry sauce… um maybe? I’ve actually had it once in the US. An Irish man had a pub in the Kansas City area, and he had the most amazing curry sauce. He offered chips or chicken fingers with it. Either way, it was delicious. Oh yes this is definitely not Indian at all :P We only have it on chips, I don’t think you’d ever actually make a curry with it. You’re right, it’s basically just curry flavoured gravy!